Indian cuisine and Indian cinema share much in common – bold colors and flavors with plenty of drama. But to the uninitiated, they can seem dizzying. Let Sri Rao be your guide. 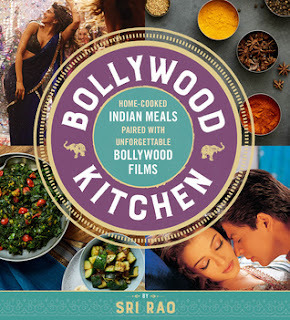 As one of the only Americans working in Bollywood, Sri is an expert on Indian musical films, and as an avid cook, he’s taken his mom’s authentic, home-cooked recipes and adapted them for the modern, American kitchen. Sri has paired each meal with one of his favorite Bollywood movies. Sri will introduce each film to you, explaining why you’ll love it, and letting you in on some juicy morsels from behind the scenes. This is a quick read and I'm happy to say it is absolutely solid on the movies. I've seen a lot of the author's selections and they are a good representation of new and old Bollywood movies that are very accessible. He also has three supplemental movie recommendations for each major selection so that if you like a film you can explore similar ones. Those also were right on the money. His descriptions are engaging and I liked the bits of extra information he scattered throughout the book. The recipes are a good blend of his mother's Indian home cooking, adapted for the American kitchen including Indian takes on American food, such as the Bollywood Burger and seasoned sweet potato fries. Sri grew up in America and he understands how to keep recipes authentic but not time-consuming. I also like the fact that each movie is matched with a full meal, so you don't have to wonder what side dishes to come up with. I made the Keema and the Chicken Rollups (street food that is like Indian chicken fajitas). Both were very good, though much hotter than I like. I'd advise cutting the cayenne in half if, like me, you don't like it hot. The way the recipes were adapted were definitely easy although the author seems to have too generous a sense of portion size. For example, the Keema was supposed to serve 4-6 using 2 pounds of hamburger. Oy veh! We halved it and it served the three of us with leftovers for 2. So keep a judicious eye on his proportions compared to how many you want to serve. Recommended for those wanting to dabble in Indian food and movies!